The Packard Street Rod Association was founded on May 3, 2013, during the Street Rod Nationals South in Knoxville, Tennessee, by four street rodders who own and drive Packard street rods. These four included Harold Gilreath, Bob Kennard, Dave Stanley and Wade Davis. They organized the PSRA with the idea that building, owning and driving a Packard street rod is a unique experience and that the knowledge gained during this process should be shared with other Packard street rod owners. Harold Gilreath, who was selected to serve as chairman of the association, drew up the Constitution and Bylaws and mailed an invitation letter to every Packard street rodder that we had met at other car shows. From the response to Harold’s letter we assembled a membership list of eleven charter members. The list included the four named above plus Bert Barrett, Tom Brown, Fred Bruner, Terry Buckles, Lynn Cawthorne, Thomas Gregg, Paul Kilgore, and Dave Stanley. 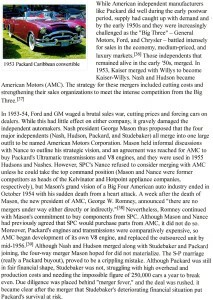 On March 29, 2014, our website, packardstreetrods.com, was created to help us reach more Packard street rodders and to grow our association. Our website is being expanded constantly and now includes our Chairman’s newsletter, classified ads, contact information, technical forum, photos of many members’ Packards, and a complete membership list. The Packard Street Rod Association logo and slogan was designed and adopted by PSRA in June, 2014. The background is reminiscent of a late 1930’s Packard grill. And our slogan, Ask the Man Who Drives One, evolved from the original Packard Motor Company slogan, ASK THE MAN WHO OWNS ONE, which was used in advertisement as early as 1910. The Packard Street Rod Association is growing. We now have 25 members from twelve states; from Florida and Alabama to Indiana and West Virginia; from Tennessee and Kentucky to Missouri, Kansas, Texas and California. So if you want to know about Packard Street Rods, just Ask the Man Who Drives One. Packard History- While everyone who owns or drives a Packard knows the history of the Studebaker/Packard merger, known as Studebaker Packard Corporation (SPC), do you know about the proposed merger with Nash and Hudson, to be known as American Motors (AMC)? Following is part of the story from Wikipedia Encyclopedia. Click on the thumbnail and it will open full size.